The Mosaic fashion community has built a successful brand over the last five years with HOPE IN THE CITY – inspiring young designers, engaging the community, and giving back to serve others. 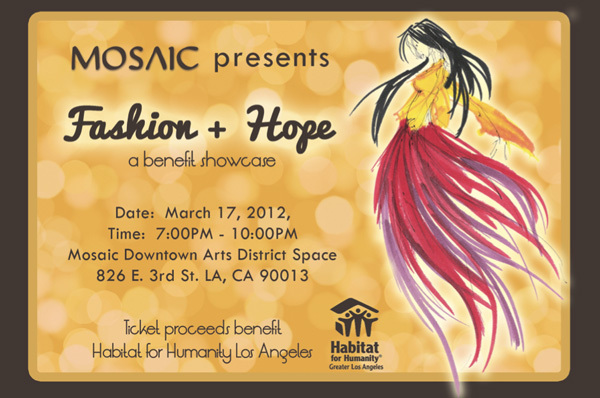 While Mosaic and Habitat for Humanity are no stranger to partnering, on March 17th 2012, the two will embark on a new exciting partnership with the launch of #fashion4habitat at FASHION + HOPE to be held at the Mosaic Downtown Arts District Space. FASHION + HOPE is a groundbreaking fashion event revolutionizing the LA Fashion community with a unique brand of fashion + call to action. The event is informed by the belief that what we do matters, what inspires us to do what we do matters most, and what can be done beyond that is revolutionary. Patrons will be entertained and called to get involved in #fashion4habitat, an online and real life campaign from Fall to Spring LA Fashion week that will raise awareness, funds, and action for three key Habitat for Humanity programs: A Brush With Kindness, Veterans Initiative, and Neighborhood Stabilization Project. 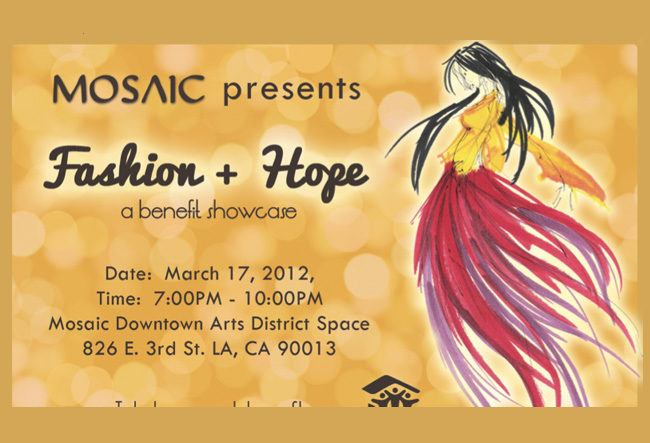 Proceeds from both FASHION + HOPE in March and from HOPE IN THE CITY in October will benefit the organization. Fashion is the forefront, but Hope takes the spotlight as stories are told and one community comes together to address the needs of the city. The desire to connect, inspire, and change informs every event Mosaic does. It takes hundreds of volunteers and relationships with scores of talented likeminded people to bring something special to the audience.